Special correspondent at Paris of the London "Times"; born at Blowitz, Bohemia, Dec. 28, 1825; died in Paris Jan. 18, 1903. At the age of sixteen he went to France, where he was appointed professor of German at the Lycée, Tours. Upon leaving that institution he visited Limoges, Poitiers, and Marseilles. He then took a course at the university until 1860, and on May 6 of that year received permission to assume the present form of his name. At this time he occupied himself with the invention of a machine for wool-carding by steam, but soon devoted himself to the study of foreign politics, contributing to several periodicals, such as the "Gazette du Midi" and "La Décentralisation" of Lyons. In this capacity of journalist he revealed the history of Ismail Pasha's special train, which caused the defeat of De Lesseps in the election of 1869; he was not prosecuted, however, owing to the efforts of M. Thiers in his behalf. At the close of the Franco-Prussian war Blowitz rendered valuable assistance to General Espirent de la Villeboisnet in facilitating the suppression of the Commune at Marseilles, by establishing telegraphic communication with M. Thiers at Versailles by means of a private wire when all other means of communication had been destroyed by the insurgents. In recognition of this achievement Blowitz, in June, 1871, received the medal of the Legion of Honor. In the following month he became correspondent of the London "Times," and in 1874 was appointed special Paris correspondent of that paper, in which capacity he, on May 9, 1874, secured permission to communicate with the London office daily from 9 A.M. to 3 P.M. by special wire. In 1875 he revealed certain alleged German planswhich it was said had for their aim a second invasion of France; and he secured the full text of the Treaty of Berlin for the London "Times" before the signatures of the plenipotentiaries had been affixed to the document. 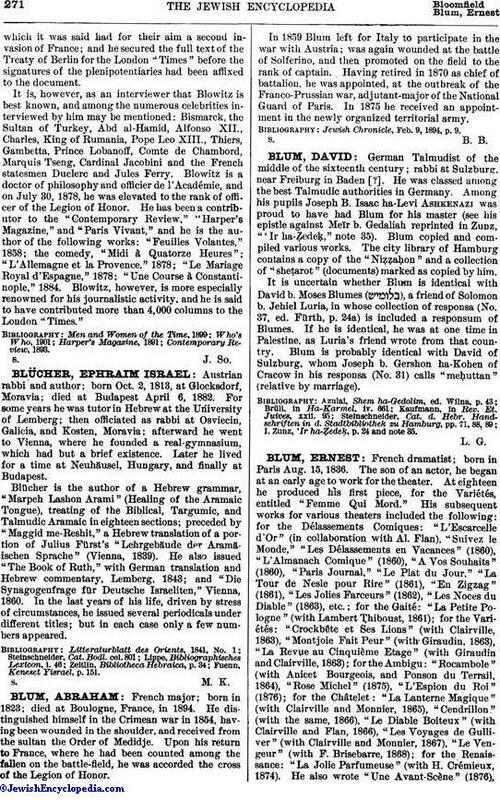 It is, however, as an interviewer that Blowitz is best known, and among the numerous celebrities interviewed by him may be mentioned: Bismarck, the Sultan of Turkey, Abd al-Hamid, Alfonso XII., Charles, King of Rumania, Pope Leo XIII., Thiers, Gambetta, Prince Lobanoff, Comte de Chambord, Marquis Tseng, Cardinal Jacobini and the French statesmen Duclere and Jules Ferry. 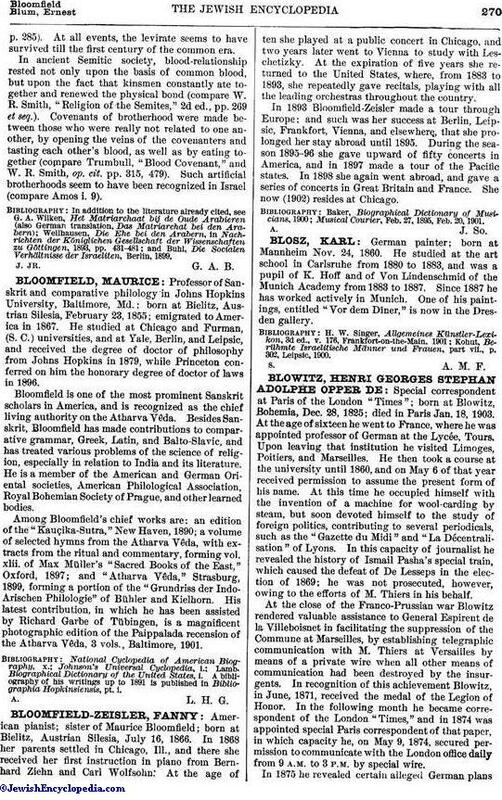 Blowitz is a doctor of philosophy and officier de l'Académie, and on July 30, 1878, he was elevated to the rank of officer of the Legion of Honor. He has been a contributor to the "Contemporary Review," "Harper's Magazine," and "Paris Vivant," and he is the author of the following works: "Feuilles Volantes," 1858; the comedy, "Midi à Quatorze Heures"; "L'Allemagne et la Provence," 1878; "Le Mariage Royal d'Espagne," 1878; "Une Course à Constantinople," 1884. Blowitz, however, is more especially renowned for his journalistic activity, and he is said to have contributed more than 4,000 columns to the London "Times."